But, here are the poll results anyway. I asked the readers what title describes them best. I had a feeling most people reading this blog were involved in science or academics in one way or another. The students win big time. That is kind of what I expected, which is really cool to see. It’s also nice to see some faculty coming by as well. 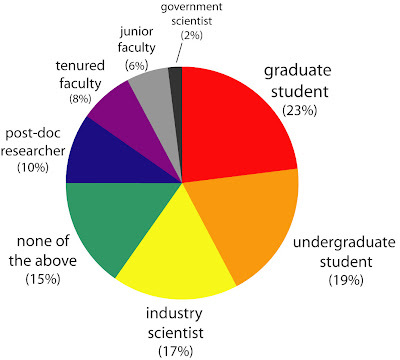 I’m not too surprised with the number of industry scientists…there are a lot of them out there. The world needs scientists, so there they are….reading blogs and taking dorky polls instead of working. Plus, I have some experience and affiliation myself with industry. I guess the big question is who are all the ‘none of the aboves’? Perhaps non-professional scientists — that is, people who love science but don’t necessarily do it as their livelihood? Maybe some journalism or policy types? Who knows….maybe just passers-by. Oh yeah, one more thing…you may have noticed how I put it in percentages to obscure the low number of samples (n=52, by the way). You should be impressed I did any quantitative analysis…I am a geologist after all. ← Where on (Google)Earth #40? Don’t you need n=117 for it to man anything? Geez…. You’ve got at least one science librarian reading.